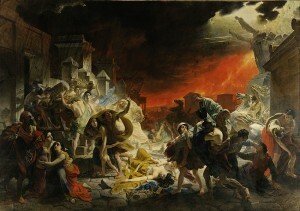 Although Pompeii is frozen in time, the workers are in a hurry — to spend money. In the next 11 weeks they have to burn through almost $100 million — about five times what they’ve spent in the past three years — or risk losing it. “This got off to a slow start,” says Antonio Irlando, president of a nonprofit devoted to safeguarding Italy’s heritage …. “Now it’s as if there’s an emergency.” Cash, Not Ash, Is Pompeii’s New Problem, Bloomberg Businessweek, Oct 19, 2015. In my over twenty years in federal service, in the US Air Force, the race to “use it or lose it” was an annual affair. I like to tell the story of getting my new organization to deliver its annual budget request on time. When I got my budget done, and no one else had theirs done, it turned out that our delivering it on time made everyone else mad at us. It was, I was quietly informed, better to stay inefficient like the rest of the organization than it was to actually get the job done when requested. Getting an operational or project budget completed and submitted so it can be executed is nothing more than just another complex task of a project. It also illustrates that money is often not the solution — almost never in my experience — to the problems an organization or project is having. One symptom of not needing but getting more money is that the organization is unable to get around to spending it. One also must take into account that governments in particular have many rules and that these often inscrutable rules can make it excruciatingly difficult to actually spend the money one gets. Are you getting all your money spent in a manner that is effective and efficient and supports the goals of the project?